I get a lot of questions from people about this and oftentimes people misunderstand what it is that I really do. Oftentimes I get labeled as a Nutritionist which is true to an extent. My education is in food science and human nutrition and I have extensively studied holistic nutrition for more than 10 years. And yes, nutrition is a huge piece of the overall puzzle and without it you’re not going to get lasting results. So there’s definitely a huge advantage to my nutrition background. But the way I practice involves much more than diet or nutrition alone. I practice Functional Medicine which looks beyond just food and works to determine the underlying cause(s) of your chronic symptoms. 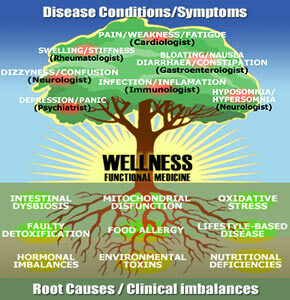 Functional medicine is an emerging field of medicine grounded in the functional application of basic sciences. Some have coined functional medicine as patient-centered medical healing at its best. Instead of looking at and treating health problems as isolated diseases, its focus is on treating individuals who may have bodily symptoms, imbalances and dysfunctions. Functional medicine seeks to identify and address the root causes of disease, and views the body as one integrated system, not a collection of independent organs divided up by medical specialties.